Give each guest who purchases a ticket a visual identifier, like one of these. Raffle ticket sales become a lot easier when you use this simple trick. Each guest who buys a raffle ticket should be given a visual identifier to alert others that he’s purchased. This avoids the common annoyance to guests: multiple people approaching to sell raffle tickets. Assume you have three teams of volunteers roaming the crowd to sell raffle tickets for a diamond bracelet. Team #1 approaches Mr. Smith and sells him two tickets. Within minutes, Team #2 talks to him. “I just bought tickets,” he says. Is he fibbing? Team #2 isn’t sure, but they move on through the silent auction. Team #3 catches Mr. Smith at the bar. They ask him if he wants to buy raffle tickets. “I’ve already bought two tickets,” he sputters. Team #3 is surprised at how grouchy he is. After all, this is a gala, right? How many times do you think Mr. Smith will be asked to buy raffle tickets? And how much time is wasted by Team #2 and Team #3 who keep approaching guests who have already bought tickets? Your guest will not become annoyed from being asked multiple times if he will buy a ticket. Your volunteers know who has purchased a raffle ticket and who hasn’t. They can focus on making new sales. 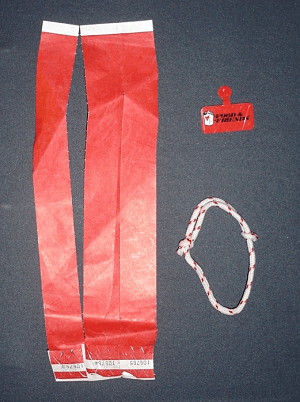 The visual identifier serves as a simple marketing tool to alert other guests about the presence of a raffle. This is a low-cost, simple trick which will work wonders through greater productivity from your raffle volunteers, better sales from your raffle, and guests in a better mood. This blog post shares a great tip for getting your raffle off on the right foot. And now to leap ahead, here’s your resource. In this 90-minute training, you’ll learn how and why some raffles are top-performing. These are phrases shared by my staff that they use to open the conversation with guests during the reception. 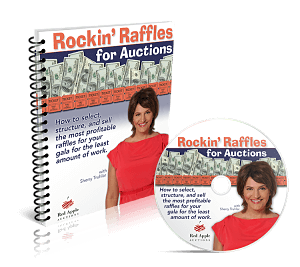 Check out Rockin’ Raffles: How to select, structure, and sell the most profitable raffles for your gala for the least amount of work. Prefer video? Watch the video of this blog post below. I don’t know how i come by here. But I believed there’s something great, i should be thankful fo dropping by at your site. Hope, we could be friends! I’m glad you are finding the site useful. Referrals to your friends are always appreciated, so feel free to refer us to whomever you know involved in a fundraising auction. 2. Another way you can have ideas easily “pushed” to you instead of you having to go “find” it on our blog is to subscribe to our RSS feed. This requires that you have a “feedreader.” Not everyone is that high tech, but if you *do* have a feedreader and regularly subscribe to other blogs for content, you can also subscribe to ours. To subscribe, you would click on the square orange button, also in the right column of this page. I think the best visual identifier to use would be the paper bracelets. It’s less likely that someone will take off an item you give to them if it sticks on their wrist and isn’t too silly. Doing an Online Raffle or a raffle at an event is a great idea. If it is a raffle that benefits a charity or some organization, maybe an identifier can be a sticker or a pin with the charity or organization’s name on it. It gives anyone who bought a ticket something to walk away with even if they don’t win. Laura, Yes, that’s true. And another great thing is the flash-y necklaces or blink-y magnet pins. It’s hard to miss those, and guests take them home to their kids.